It turns out that it doesn't matter how fast sperm can swim when it comes to fertilizing an egg—it's all about its length. By studying the ejaculate traits of fruit flies (which must be the teeniest load on the face of this earth), scientists found that sperm that are longer and slower are more likely to fertilize an egg than those that are faster. For the study, which will be published in the journal Current Biology, scientists mated different fruit flies with the same female. The flies were genetically modified to produce fluorescent sperm, with one group glowing red and the other glowing green (Christmas-y!) so that researchers could watch the rival sperm battle it out in a race to the egg. 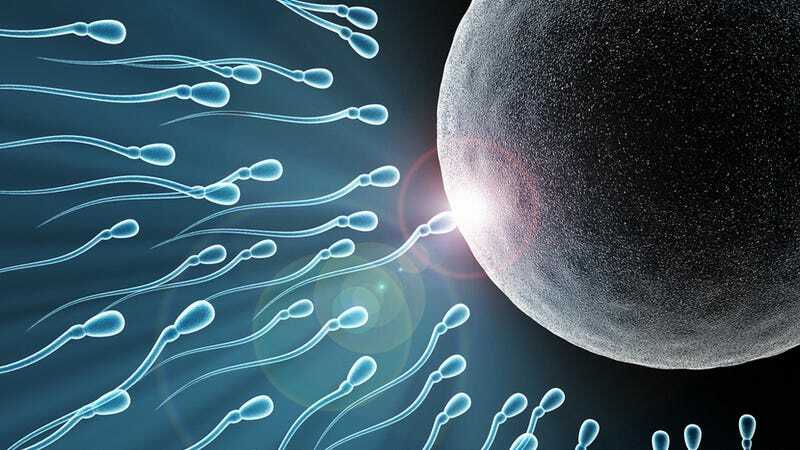 What they found was that speed was not an advantage, since all the sperm were going to the same place and had to wait around for the egg to be released anyway. The slower sperm tended to be longer, and were more effective at kicking out the faster sperm that had been waiting around, meaning that the longer sperm tended to get the egg. The conclusion: Bigger is better, even with fruit flies.